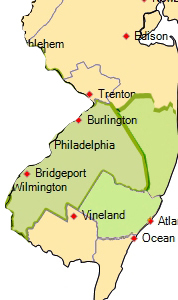 Next Level Remodeling serves the South Jersey region and points beyond. If you are considering a home improvement project, and you’re not sure if we serve your area, please call anyway. If you are within a 25 mile radius, it’s likely we can help you. If not, it is just as likely we can direct you to trusted associates more in your proximity. Call today to schedule a free no-obligation appointment.